How to Mark a Quilt Top? Along with planning how I’ll quilt the pink and cream top, I’m pondering how to mark the quilting lines. There will be cables and probably some feathers, the stencils are handy. But, as the background is a solid cream, the Pounce white powder obviously won’t show up and I’ve read that the blue powder sometimes doesn’t come out. Pencils are out — too many times I’ve read about pencil marks not coming out without practically rubbing a hole in the fabric. The vanishing pens or wash-out pens? Again, I’ve read some not-great reviews about those. I’ve used the chalk pencils in the past and will probably use these again but, as it has been a while since I’ve thought about this, I’m wondering what do you use? Is there some new tool for marking that absolutely comes out easily without affecting the fabric? What do you use? Rose Marie (Applique & Patch) has tested and swears by the crayola washable markers. She’s done a test on her blog to share that, too. I’ve gone to using a hera marker myself. No marks at all. It works great and even I can see it with my visual challenges. So… that’s my thing. Sometimes I do use pounce but only if I’m lazy and don’t mind about anything. My new favorite is a washable graphite marker but I’m not sure I would use it on so much uninterrupted cream. The instructions DO WARN that while light marks may be removed with water only, dark marks will require soap of some kind. There are photos and ordering info at http://www.nosliphoops.com/markers.html. I don’t mark the fabric at all. I trace the quilting design onto lunch wrap – it’s a bit like slightly stiff tracing paper – pin it to the quilt, and quilt through it, following the lines I have marked. I use pencil rather than marker so the thread doesn’t pull ink into the fabric. When the quilting is done I tear it away. Glad Press and Seal. I lay a sheet of the product over my paper design, trace with a permanent marker, peel it off and stick it to the right place on the quilt, quilt, and peel off to remove. I have been able to reuse this several times if I am careful not to distort it when removing it. The only caution is, I wonder if a mark might travel if the sandwich with your quilt were to sit in the sun, such as inside a closed car when it is hot outside. I did not have this happen, but I’m a little paranoid about heat with most markers, due to mishaps with other methods! Tis quilt is going to really show off the quilting! How beautiful! Well, I u that refillable chalk marker that has the little roller on the end. Cant think of the name. You put the powder chalk in it, but its white and wont work. I have used a bic retractable pencil ever so lightly, but wouldn’t on this… I’m curious about the other suggestions now! Let me know what you end up doing and I’m sorry I’m no help. Hi, Cathi. I use the marker that comes out with heat (like an iron) — it was like magic! I used it on a light beige fabric with no problem. You might try it on a scrap of fabric and see how that works on your fabric. I was going to suggest the same as Karendianne. Those crayola pens are designed to come out from kids clothes. Also, I have a quilting video that suggests these too. However, I would use a light colour and test it first on a scrap piece of the same background. Other than that I would use a blue wash out pen…. but be careful not to iron it. ps I hope the kitties are well. The directions and testing results are explained on a instruction sheet that comes with the pencil. The warning is that you cannot iron the marked fabric, expose it to direct sunlight or put it in the dryer because the heat will set the markings. Otherwise warm water and a small amount of clear dish detergent will get it out or soaking it for 30 minutes with lukewarm water and a small amount of laundry soap will do it. Nice pencils, it’s a blue barreled pencil that comes with a vial of extra lead (mechanical pencil). I have so many different marking tools and have tried most. I like using some form of chalk when possible. Although, I have had problems with blue. I like Roxanne’s chalk pencils, but I have found that if the gray stays on too long, it is harder to remove. I also like the Bohin marking pencil, but haven’t tried it in many colors. I know others that like using the yellow with the Bohin pencil. I just bought a Hera marking and will be giving that a try with some straight line quilting. Good luck. I used watercolour pencils and a light touch…so far I’ve had good success with this, though I’d always recommend that you test them first before using them. couldn’t have a good bath at the end! I mostly use the blue water soluable pens and the Crayola Washable Markers. I have not had any problems with either of them. I alway run my quilts through the rinse cycle, make sure the blue pen is gone then run it through with detergent to get the Crayola out. I mark with a plain old #2 lead pencil. I mark with a light hand and have not had trouble with the marks not coming out. On dark fabrics, I use chalk – but I don’t care for that too much. The dust tends to wear away long before I have completed my stitching in any given area. 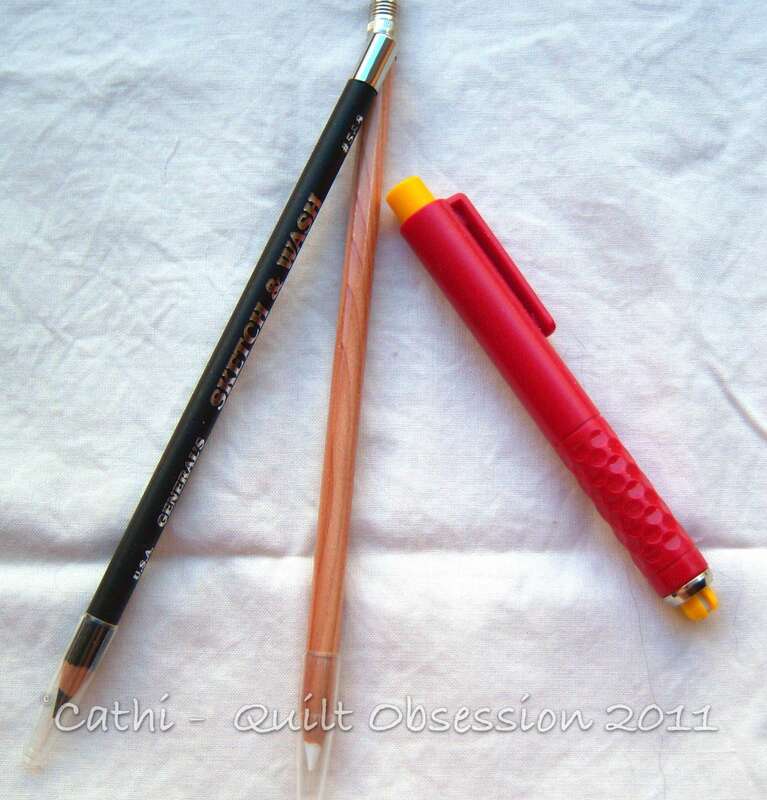 Cathi,I use the Bohin Marking pencil…it has always come out for me and the pencil works like a mechanical pencil and takes “chalk” leads which rub out easily..usually by the time I have quilted over the line it is gone…You can get the chalk leads in white or yellow. It comes with an eraser that does erase the line. You can see the pencil online. It’s worth the price IMHO. 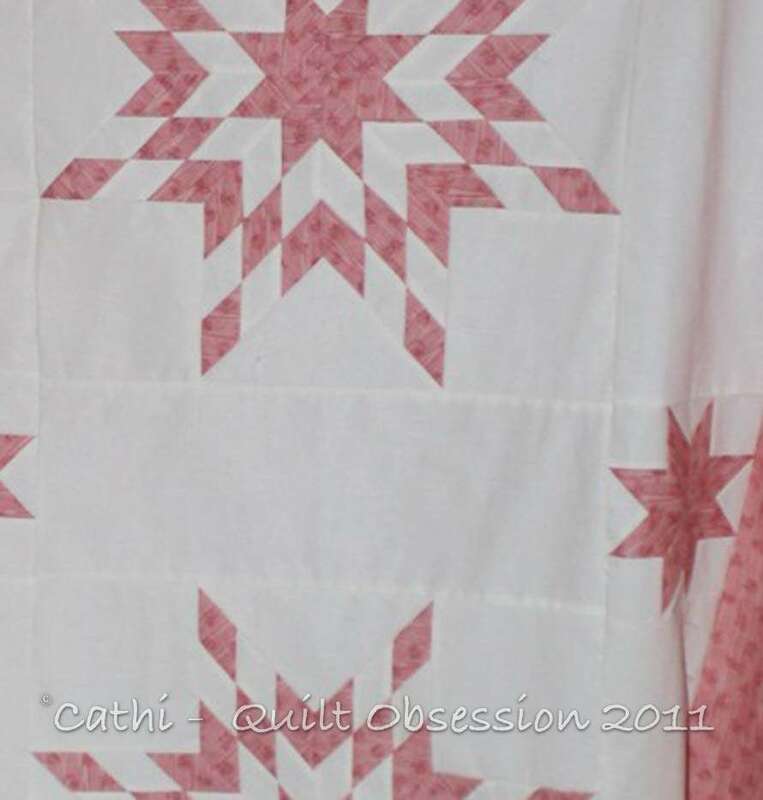 I use a pale pink watercolour pencil on pale fabrics and haven’t had any problems so far…gorgeous quilt top! Hi Cathi… I use the Marvy purple marker…its does disapear well and I have had no prolem with it. I also use a balck and/or blue Berol washable ink pen. this look bad when you draw it on the cloth – but for me it has washed out wonderfully…you can see the relsuts of my last wash on my blog…. a few days back. If you would like to know more let me know. I love what you are planning. I have a chalk pencil for quilters in grey I believe I got it from the stencil company in the US and it would mark on white. Otherwise I use Glas Press and Seal marking on that with a permanent pen which will NOT transfer to the cloth underneath and quilt through that. The press and seal will cling very nicely to fabric. Unfortunately it came here and went in the same year (obviously not able to sell very well here). good luck the quilt top looks lovely. Hope the kitties are conyinuing to improve. I think I have all the products you listed and the ones left in comments, but have yet to try most of them! LOL. The only one I would not use is the Crayola pens. I like to use washable fabric marker (blue ink). They stay on the fabric well, and washes out quite easily even though sometimes you might have to wash it more than once depending on the type of pen you use. I have tried several different methods and like washable crayons markers the best. They are not very expensive and have no trouble wadhing them out. With cream and/ or white, I would mark very likely and use the lightest color possible. Also, I replace my markers every year because the composition of the marking dyes could change over time and I would hate for it not to wash out. I am still experimenting with marking on dark fabric. Currently the white marking chalk pencil works best. I like the disappearing white pen but the pointy roller tip feels like it is going to poke a hole in my quilt top so I refrain ftom using it. Hope this helps.